Ernst Mayer was the Alexander Agassiz Professor of Zoology, Emeritus, at Harvard University. 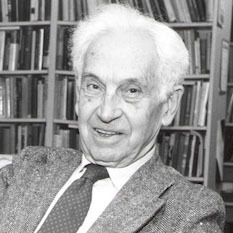 Mayr was one of the 20th century's leading evolutionary biologists. He was also a renowned taxonomist, tropical explorer, ornithologist, and historian of science. His work contributed to the conceptual revolution that led to the modern evolutionary synthesis of Mendelian genetics, systematics, and Darwinian evolution, and to the development of the biological species concept. Photo courtesy of Harvard University.